← Are Jehovah's Witnesses preaching a false message? QUESTION #17 – According to Revelation 22:6, Jehovah sent his angel. However, several verses later in the same chapter at Revelation 22:16, it says Jesus sent his angel. How can this be true unless Jesus is Jehovah? Jehovah’s Witnesses believe that Jehovah has given Jesus all authority, in heaven and on earth. That means Jesus has been given authority over Jehovah’s angels. They follow his commands as if he was Jehovah. QUESTION # 18 – If Jesus became Michael the Archangel after his death as a human, why is he still referred to as Jesus from Acts onward? Jesus has had a unique and extraordinary existence. For unknown eons the person who became Jesus lived in heaven prior to his becoming human. He was not known as Jesus then. That should be evident from the fact that the name Jesus literally means “Jehovah is salvation.” Needless to say, the Word was in existence long before mankind even existed or came to be in need of salvation. Since God himself and every person and every angel has a personal name, obviously the Word had a personal name too. There are many reasons to believe that his original name was Michael. When Jesus gave his life and was then resurrected and ascended back to heaven he resumed life as Michael, the foremost angel. However, he also retained his earthly name as well. That should not be considered odd or unusual given the fact that Jesus has lived in two completely different realms of existence —human and spirit. But it is what Jesus did as a human that is the basis for our having a relationship with him now. For example, Jesus’ kingship derives from the fact that he was an heir to the throne of David. And his having been born again as the first person anointed by God is the basis for Jesus becoming a spirit. And his title to the throne of Israel transfers with him. After all, it is as Jesus said to Nicodemus in the 3rd chapter of John, “what is flesh is flesh and what is spirit is spirit.” In other words, humans made of flesh and blood have no ability to transcend into spirits. The notion that humans have a spirit that survives death is the stuff of myth —the foundational lie of virtually all demon religion. The point is, had Jesus not been begotten by holy spirit to become a new creation he could not have returned to heaven. So, it is most appropriate that the Word retain his earthly name since that defines his identity now. QUESTION # 19 – If Jesus became Michael the Archangel after his death as a human, did Jesus lie when he said in Revelation 22:16 that his name is Jesus? QUESTION #20 – If Jesus is now Michael the Archangel, why is it that you pray to God in the name of Jesus and not in the name of Michael? QUESTION #21 – Since you believe the man Jesus ceased to exist and he became Michael the Archangel, wouldn’t you be in an unsaved condition since the Bible clearly says there is no name other than Jesus by which we must be saved (Acts 4:12)? No untaught churchgoer can possibly hope to comprehend the deep things of the truth. But the truth is, as mentioned already, Jesus was born again. No trinitarian can comprehend this, but Jesus was the very first person to undergo the anointing by the holy spirit. That is why in the eighth chapter of Romans Paul referred to Jesus as the “firstborn of many brothers.” His “brothers” being those who are also anointed and adopted as sons of God. Upon Jesus’ death he ceased to exist as a living, breathing man. Upon his resurrection he became a spirit. That is because he had been born again prior to his death. The man Jesus, the flesh and blood body was sacrificed to God. It is gone, forever, as payment for our sins. Jesus did not come back to life as a man. But, Jehovah’s Witnesses believe that Jesus’ sacrificial course as a man provided the ransom, and our faith in his life’s course, death and subsequent resurrection, is the basis for salvation. The fact that Jesus resumed his former name of Michael is irrelevant. QUESTION #22 – If Jesus is Michael the Archangel, then wouldn’t Jehovah also need to be an archangel in order for Hebrews 1:3 to be true? Trinitarianism is the epitome of stupidity. Trinitarians believe that there is a father and son who do not have anything remotely similar to a father/son relationship. It is a mystery why they even pretend to be Father and Son. Although the Scriptures reveal that Jesus had a prehuman existence and was the very first creation of God, trinitarians claim he was uncreated. Truly, the stupidity of trinitarianism is simply staggering. In the darkened mind of a trinitarian Jesus must be playing some sort of shell game, pretending to be a son who intimately knows God, when in fact he is nothing of the sort. He is God, who only pretends not to be. QUESTION #23 – If Jesus is Michael the Archangel, why did God command in Hebrews 1:6 that ALL the angels worship (do obeisance) him? As the context of Hebrews indicates the command for all of God’s angels to bow before the Son takes place at Christ’s second coming. Before that event the angels are not required to worship him. Interestingly, Revelation the 12th chapter depicts Michael and his angels battling with Satan and his angels. Notably, too, that battle erupts when the Kingdom of God comes to power. Elsewhere, though, the angels are shown to be under the command of Jesus. So, whose angels are they — Michael’s or Jesus’? There is no question that it is Jesus who leads the war against Satan. It is unthinkable that anyone other than Jesus would do so since he is destined to crush the serpent. But, there is Michael leading the charge. It requires some intelligence to make the connection. But, Jehovah does not command the angels to bow before Michael. They are commanded to do obeisance before Jesus Christ for the reason that Jehovah decreed that his Son should be so honored for having obeyed God without reservation. True, Michael and Jesus are the same person, but he is honored for what he did as a human. QUESTION #24 – If Jesus is Michael the Archangel, why does Hebrews 1:13 say “about which of the angels…”? Trinitarians possess an impenetrable denseness of mind. In their folly they would attribute their own foolishness to God, imagining that since God did not speak those words to any angel he therefore had to be speaking to himself, proudly declaring himself to be his own son and then inviting his son-self to sit beside himself until he places all of his enemies as a stool for his own feet. Even though they apparently read the Scriptures looking for bits and pieces to prove their lie, it is simply beyond the grasp of a trinitarian that Jehovah did not specifically honor any angel by declaring him to be his son, but he did honor a man in such a way. The reason that is extraordinary is because, as Paul said, humans are by order of rank a little lower than the angels. So, Jehovah elevated a man above the angels. A trinitarian can never understand this. If Jesus is Michael the Archangel, why does Hebrews 2:5 say that it is not to angels that God has subjected the Earth to come, but just a few verses later at Hebrews 2:8, it says that ALL THINGS have been subjected under Jesus? Again, the empty-headedness of trinitarians is on full display. They exhibit a profound and utter cluelessness about the matters they pretend to know. As the second perfect man, the last Adam, and being related to Adam via Mary, his birth mother, Jesus inherited the right to fill the earth and subdue it, which no imperfect human could accomplish. However, it was not Jehovah’s will that he do so as a man. And for a fact Jesus is no longer in a state of existence lower than the angels. But, as mentioned already, even though Jesus sacrificed his flesh he retains the rights he acquired as a human —when he was a little lower than the angels. Thus, as a glorified spirit Jesus is still entitled to subdue the earth and this he will do when he comes in the glory of his Father and assumes regency over the earth. 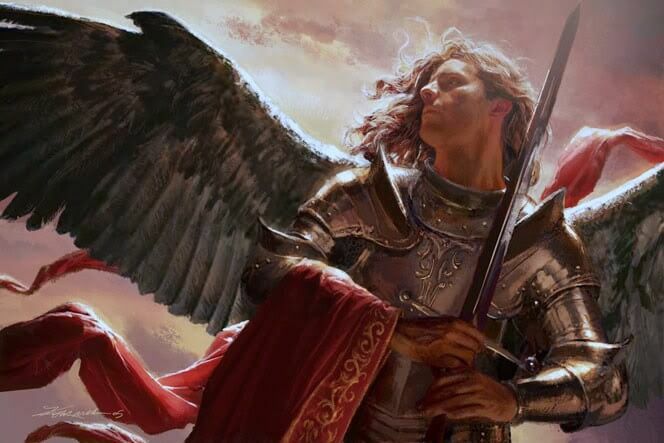 QUESTION #24 – If 1 Thessalonians 4:16 proves Jesus is Michael the Archangel simply because Jesus comes with the voice of an Archangel, doesn’t this also mean he is a trumpet because he comes with God’s trumpet? QUESTION #25 – If Jesus is Michael the Archangel, how could all things have been created for him and through him (Colossians 1:16)? Leave it to the trinitarian to explain how God is the Firstborn of all creation. It is at the very least amusing. And, Is Jesus Michael the Archangel?